Yearbook – Meeting is cancelled. Members please work on your pages over the break. Staff please send in your pictures. Gr. 4/5K – Play Performance today at 11:30am. Healthy Hunger – Pizza Hut. Easter Break – No School: Fri, Apr 19 – Fri, Apr 26. Classes resume on Mon, Apr 29. Students – Please remember to walk you bikes/scooters/skateboards and any other modes of transportation in the front of the school until you’re past Ecole Holy Mary School. Boryski’s Meat Fundraiser packages have gone home, students can start selling! Orders are due May 1st. Students – Please remember to walk your bikes/scooters/skateboards or another other modes of transportation in the front of the school until you are past Ecole Holy Mary School. Boryski’s Meat Fundraiser – Goes home today! Orders are due May 1st. Classroom prizes are Pizza Party, Movie Party or Swim Party. 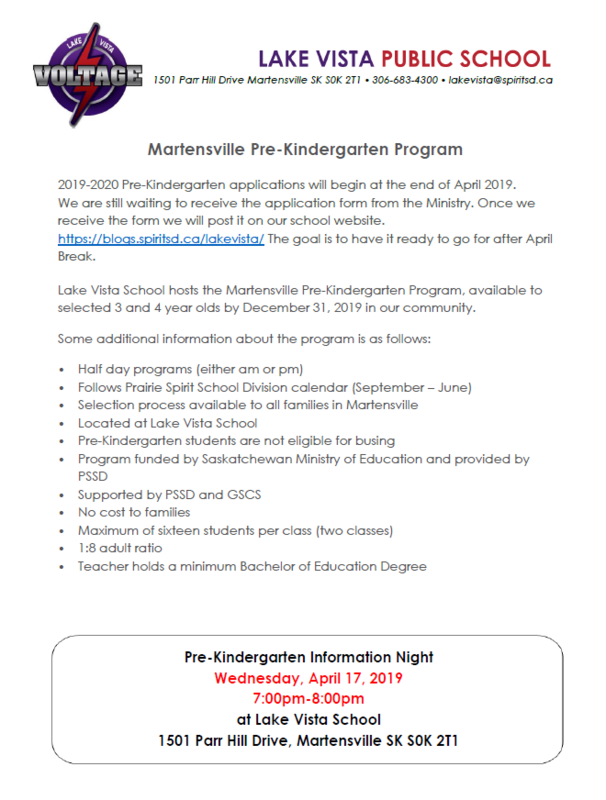 Pre-Kindergarten Info Night – Tonight at LVS at 7:00pm. No School – Friday, April 19th – Friday, April 26. Classes Resume: Monday, April 29th. Prairie Spirit encourages parents, students and community members to participate in the Ministry of Education’s survey to identify priorities for the development of a new provincial education plan. · what needs to change in Saskatchewan’s schools. Please go to the following link to complete the survey, which closes on Friday, May 10. Thank you for your participation! LVS Boryski Fundraiser – Order forms are going home tomorrow. The due date is May 1st. The top three classrooms will get a choice of a prize: Class Movie Party, Class Swim Party or Class Pizza Party. Tinkercad Club (Green) – Today at lunch. Plant Club – Today after school.